There's been some fantastic bicycle momentum going on in the advertising world in the last year or so. Since I decided to start monitoring ads in the middle of 2012, there seem to be more commercials showing bicycles positively, and in many cases featuring them front and center to sell their product. This first one has been running for a few months. Del Monte is selling Green Beans and of course they want you to associate veggies with good health & fun. So why not show a couple out on a jubilant bike ride? Although it's obvious they're wearing contemporary clothing (and, yes, helmets), this commercial evokes a classic feel, like a throwback to the 1950s or 60s. 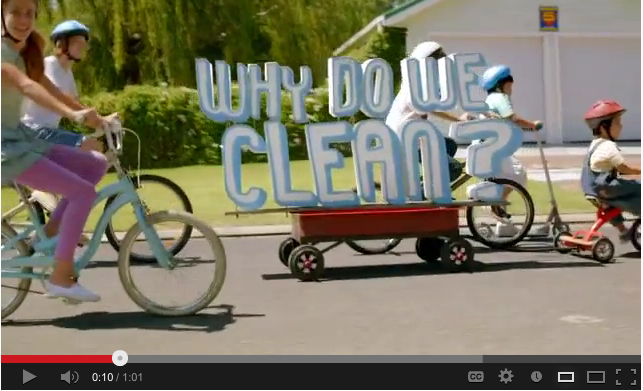 The next spot just debuted from Lysol who have been doing a push for their "Mission for Health" campaign. It features copious youngsters riding their bikes thru their neighborhood leading a parade of floats to their school. Despite how you may feel about cleaning products, the target here is obvious: since moms tend to make the decisions in the household on what cleaning products to buy, they are here front and center flocking along with their bike-riding, walking and scootering kids. I'm not sure if this does much for bicycling, but it sure would be nice to have more suburban neighborhoods with this much activity on their streets. It reminds me a lot of Portland's Neighborhood Greenways. JCPenney is on a critical mission to re-vamp their image after a disastrous 2012 sales year where they lost many of their core store customers. 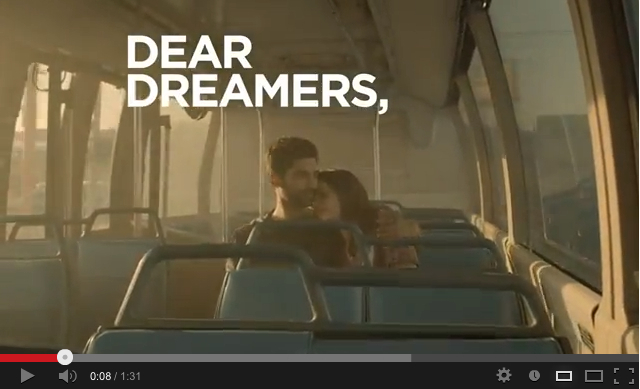 Thus they produced this new heartwarming spot aimed at inviting us to shop there again. Despite the lavishly crafted spot, it's not gonna lure me in, but I really appreciated the three consecutive scenes featuring a snuggly couple on a bus followed by a bicyclist riding gracefully over the L.A. River and then a young lady happily walking down the streets of San Francisco. Screenshots are below or just watch the commercial linked to above. Sure it's only ten seconds of "Yours Truly, JCP", but it's clear that advertisers want to appeal to the young people demo. And younger people are increasingly driving cars less and using alternatives. In fact in the entire 90 second appeal, not one person is shown in a car! Perhaps times are slowly changing. Posted in Streetfilms News. 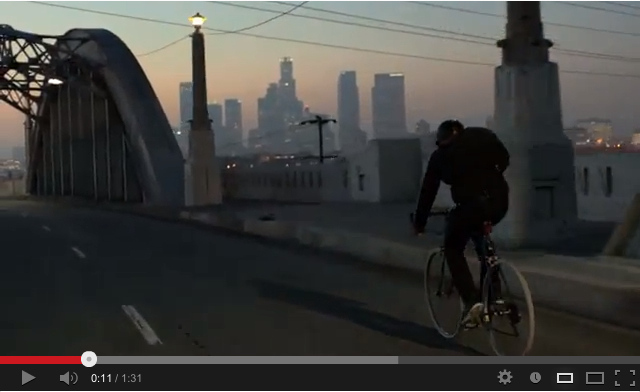 Tagged as Bicycle Commercials. This has been going on for years, especially in the fashion section. I guess, riding a bicycle makes you look French or something, even more so when you are 5' 10" and weigh 100 pounds and are wearing something gauzy. I'll take it even if I wear tweed. "a snuggly couple on a bus followed by a bicyclist riding gracefully over the L.A. River and then a young lady happily walking down the streets of San Francisco. " I'm pretty sure that the woman is walking in downtown LA, note the distinct orange Metro bus in the background between the 14second mark and the 15 second mark. Can also see that's Metro during the 16 second mark.